Uncle Sam towers above the crowd. 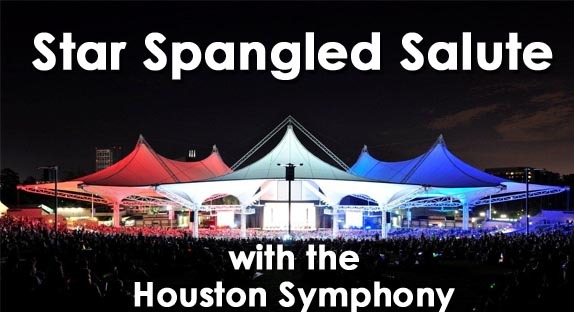 It was no surprise that the Houston Symphony’s annual Fourth of July Eve concert at the Cynthia Woods Mitchell Pavilion was everything residents of The Woodlands area have come to expect, and more. What may have been a surprise was the earlier afternoon thunderstorms that cooled summer temperatures delightfully in advance of maestro Michael Krajewski lifting his baton that evening. 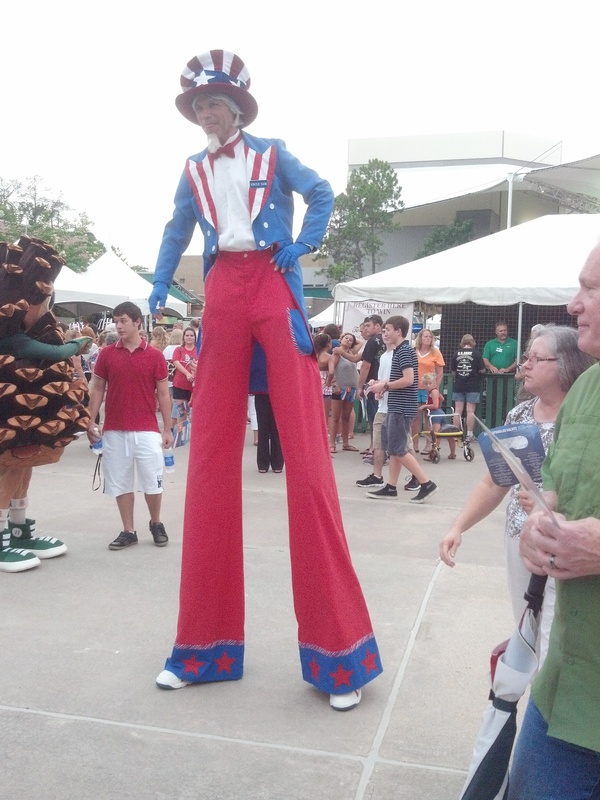 Even before the concert began there was patriotic fun out on the pavilion plaza where youngsters could capture free American flags and little red, white and blue pinwheels, while meeting a very tall Uncle Sam and the very puffy Woodlands mascot, Puffy Pine Cone™. 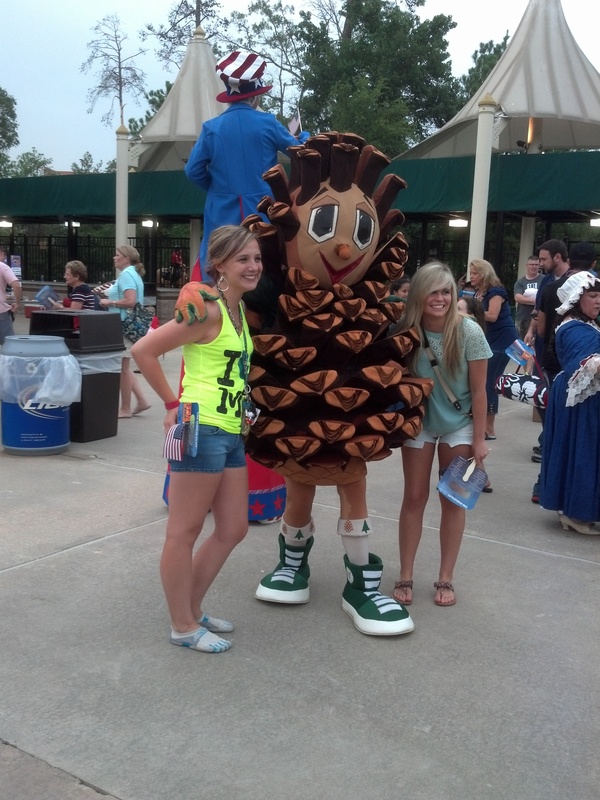 Puffy Pine Cone™ greets pavilion visitors. 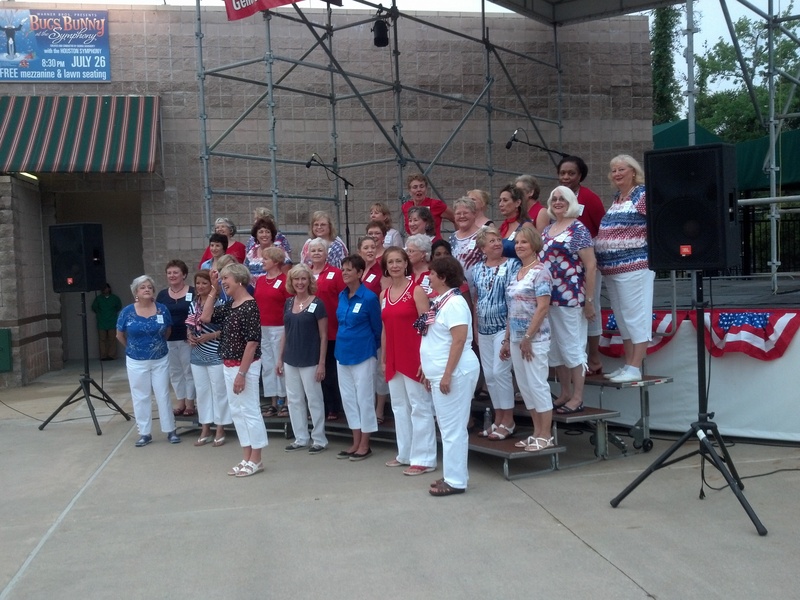 With the Houston Symphony just recently returned from performing at Carnegie Hall in May and touring Russia in June, now it was on to the symphony’s always delightful celebration of America’s Independence Day. Opening with a rousing “Fanfare and Star-Spangled Banner,” I have never before heard heard a full-house audience join so enthusiastically in singing the national anthem. Next came the beautiful “American Salute,” by Gould, with its lovely variations on the theme of “When Johnny Comes Marching Home.” John Williams’ thrilling “Olympic Fanfare and Theme,” followed. Then Krajewski joked about there being no Revolutionary War hard feelings with our now good friends in Great Britain. In recognition of that reconciliation the symphony performed Elgar’s, “Pomp and Circumstance March,” which no doubt had many in the audience reflecting on graduation days gone by. There was a merry and playful Wendel arrangement of “The Original Ragtime Band,” and then a prize-winning Jersey Village High School quartet of young woodwinds players stepped forward having won the right to perform with the symphony for Gershwin’s “Strike Up the Band.” A smooth and elegant “America the Beautiful,” then closed the first part of the program leaving me with the hope that our nation can always be worthy of the best of our patriotic music. All of that would have been enough entertainment, but still to come was the annual honoring of service veterans in the audience as the orchestra played Hayman’s “Service Medley” while inviting members and veterans of each armed forces branch to stand with their families for recognition. Lastly, in final tribute to American independence, the orchestra performed Tchaikovsky’s thrilling “1812 Overture.” As the sixteen cannons on the hilltop boomed, one could not avoid feeling that the sounds of American freedom were once more echoing across the land. This entry was posted in BroadwayStars.com, Concert Reviews, ThePeoplesCritic.com and tagged classical, concerts, Cynthia Woods Mitchell Pavilion, Houston, Houston Symphony, music, Reviews. Bookmark the permalink.